Hydroelectric power must be one of the oldest methods of producing power. It is the most important and widely-used renewable source of energy. As per estimate, approximately two-thirds of the economically feasible potential remains to be developed. Untapped hydro resources are still abundant in Latin America, Central Africa, India and China. Fuel is not burned so there is minimal pollution in hydropower generation. It runs with water which is provided free by nature. Also, hydropower plays a major role in reducing greenhouse gas emissions. According to the engineers, the invention does not need a lake, river or a dam to run unlike other common hydroelectric power plants. The plants are run using water tanks mounted on tall buildings. “Between water tanks, we set our turbines, which together with other internal systems, are powerfully set in motion by the water,” one of the inventors, Edmas Gozo, told NewsDay Weekender. “Unlike in other common hydropower plants, the water is not wasted away, but keeps rotating in the systems of our new power model, as it infinitely generates electricity, ” as reported by News Day. Gozo, an electrical engineer by profession, and Jeremia Sundire, a water engineer, started working on the model in 2010 and emerged with the complete concept in 2013. 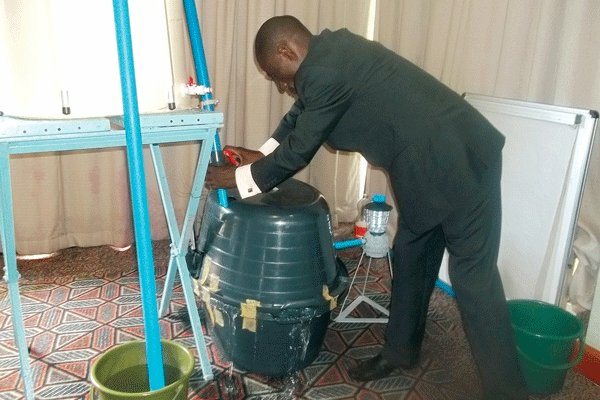 The engineers launched the invention in Harare on Tuesday, where demonstrations were held at an event attended by representatives from the Ministry of Energy and Power Development. The inventors were now looking for investors to turn the project into a commercial venture, which they say can produce 300 megawatts of electricity. “Three hundred megawatts of electricity is our average production, but we can produce more electricity using our invention depending on the demand. We will be able to produce energy not only for Zimbabwe, but for the whole of Sadc,” Gozo said. But the engineers said this was only possible if investors supported the programme. Get more information about this Patent by clicking link WIPO Patentscope. Title of Invention: A Hydro Engine and a pump powered by water / This Invention relates to a Hydro-Engine. The invention is now registered with the World Intellectual Property Organisation (Wipo) under application number PCT/AP2011/000003. The invention provides a pump which is also an engine, powered by water, to pump liquids containing suspended particles. The system comprises a set of pipes (29) driven in a reciprocating movement by a crankshaft (28) attached to a shaft (35) driven by a speed gear (34) which also is driven by a hydro turbine (20) powered by a hydrant pipe (21), which gashes water against a hydro-turbine, from member (36). Many known pumps are driven by fuel engines, some by electricity, or manually driven. The world relies mainly on fuel engines and electricity. Main problems found on fuel engines are fuel price hiking, emissions of dangerous gases in the air like carbon monoxide from petrol engines, carbon dioxide from diesel engines. When electricity is used, high percentage of polluting the air is expected from coal power stations, high bills of money are charged e.g. to those operating irrigations, and also power shading is to be expected any time. All these problems are found to people running their pumps with fuel engines and electricity. We also have many pumps which are manually operated, which demands one to be fit to operate it. Some need more than one person to operate, thus leaving other jobs unattended to, and it’s already a problem. But this hydro-engine and pump is fuel and electricity free to run, because of its system which is driven by water. Therefore it solves all the above problems found in the pumps driven by fuel, electricity and manual engines, thus solving the world’s problem. One object of this invention is to provide a pump run by a water-powered engine which is able to pump liquids containing suspended particles and is able to maintain such particles in suspension. The second object is to provide water -powered engine which can drive pumps and electricity generators.